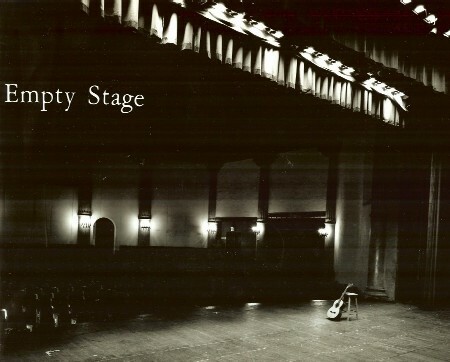 Empty Stage Music is a "non-pitching" BMI affiliated music publisher, established in 1976 to hold the publishing rights for me for the songs I had written and was then pitching in Nashville. Currently, I am finding and booking venues for a select group of Nashville independent Americana, Jazz, Blues and Country performers. In 1979 I registered three songs with BMI that were recorded and released on Rounder Records. Dale Youngs and the Country Rebels recorded one of my songs, (Oh Lord I'm Lonely) Won't You Stay With Me, and two written by Dale. The album, Walkin' Down an Old Country Road, was produced by Jim Pierce and Roy Drusky. At the time, Dale and his band (Eddie Weidow and Jim Davies) were the opening act and backing band for Roy Drusky. Empty Stage Music now will be the publishing and business mechanism (read: record label) for handling my current recording efforts, consisting primarily of compiled electronic loops. I also hope to produce an album of songs I have written. When that happens, I may start “pitching” again.